Looking for a quick and easy Halloween DIY idea? 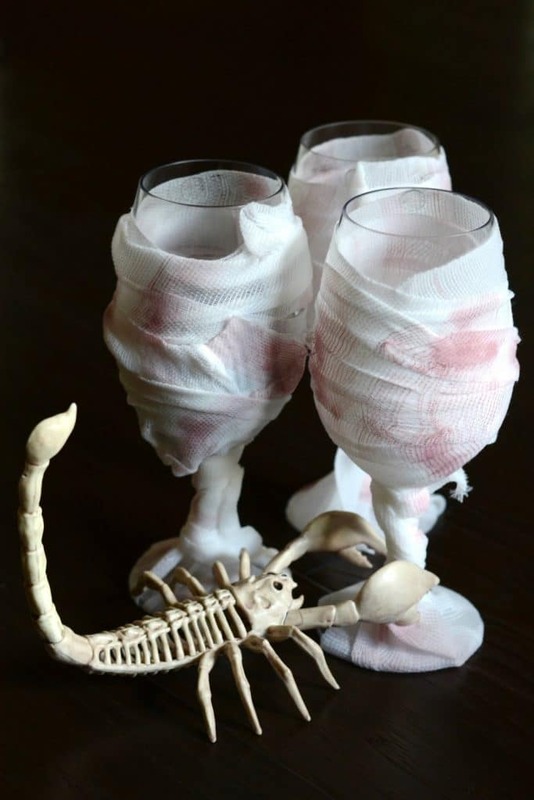 These mummy wine glasses are a fun and inexpensive way to spice up an adult Halloween party. You can decorate regular wine glasses in mere minutes, and your guests will love them! I totally get sucked into browsing the awesomely spooky Halloween decor that lines store aisles this time of year. But for budgetary and space-saving reasons, I don’t like buying lots of seasonal decorations that can only be used for a few weeks, once a year. I’d rather take things I already own and add a little twist to make them festive. 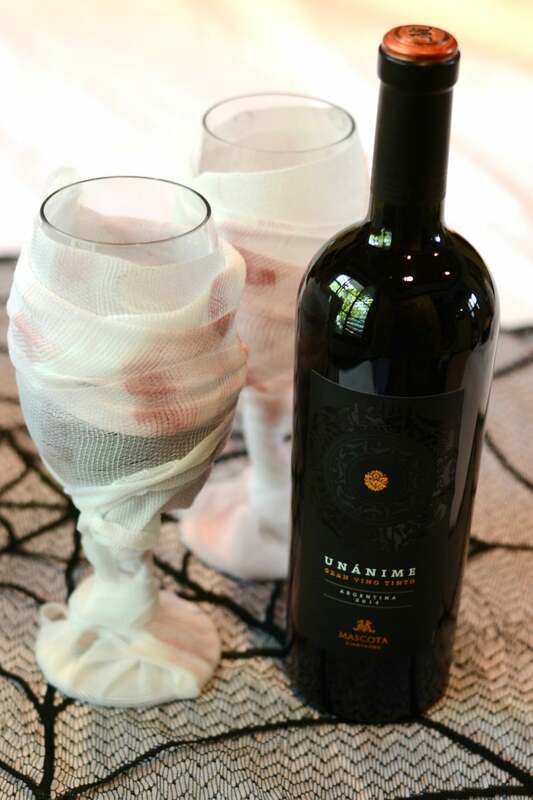 These mummy Halloween wine glasses are a perfect example! You don’t need to run out and get special glasses just for Halloween. 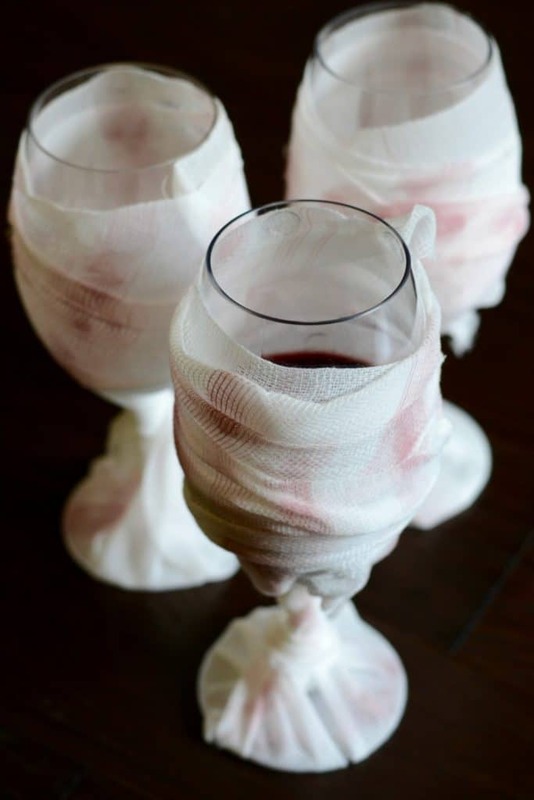 Just take the wine glasses you already have, and make your own DIY mummy glasses with a few inexpensive supplies. They are perfect for an adult Halloween party. This technique will also work on regular drinking glasses if you’re not a wine drinker, or if you want to do this for a kids’ Halloween party. Here’s how you do it! Press one glue dot near the top rim of the wine glass, and press the top edge of the gauze into the glue dot until it sticks. Place another glue dot about two inches away, and repeat. You’ll want to wrap the gauze around the top of the glass, but make sure you leave room in one area so that guests can drink out of the glass without having to put their mouth on the gauze. Once you’ve secured the first wrap with glue dots, continue wrapping the gauze around the glass. You’re not aiming for perfection here — adding little tears and folds as you wrap will just make it look spookier. 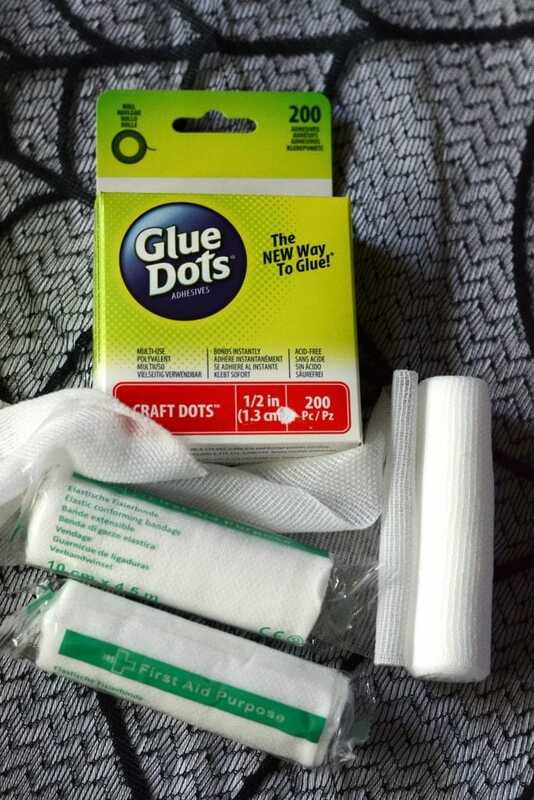 Occasionally add more glue dots as you work your way down, so that the gauze sticks to the glass. When you reach the bottom of the glass, stretch the gauze over the bottom and then bring it back up. Do this two times, so that the bottom is covered. Secure the gauze by tying a knot around the stem. After your gauze is in place, pour a little red wine into a shallow bowl, and use it to paint on some “blood” onto the gauze with your finger. Add as much or as little as you like! The best part about these mummy glasses is — even if some wine spills out, it will only add to the look! If you don’t like red wine, you could also use markers or paint to create the “bloody” effect. In a few days, I’ll be adding a video to show more details on how to make these glasses. If you make them yourself, post a pic on Instagram and tag me at @goodinthesimple. I’d love to see your own personal take on this fun DIY! I will be dong this for sure at my annual halloween soiree! !